including at least 10 civilian casualties. 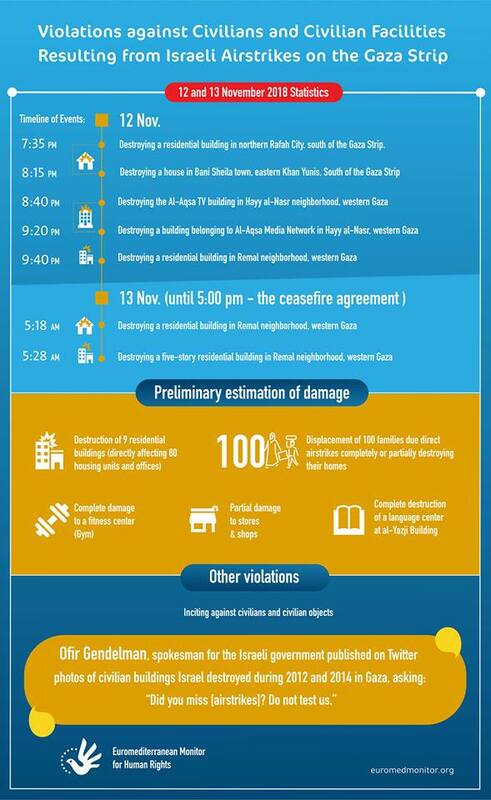 The first estimates of the damage incurred by the Israeli raids until the evening of 13 Nov. (with the announcement of a cease-fire agreement at 6:00 pm) indicate the destruction of nine civilian buildings, including 80 housing units and offices (affected by direct or indirect targeting), thus resulting in the displacement of 100 Gazan families from their homes. In addition, the Israeli airstrikes resulted in dozens of shops being partially destroyed, as well as a gym and a language center located within the Yaziji building, which was turned into ruins. The current escalation will have its toll mostly on civilians, warned the watchdog group, calling for sparing civilians the repercussions of the military operation. All parties must adhere to the rules of international humanitarian law and must avoid committing war crimes, added the nonprofit human rights organization, reminding that the International Criminal Court extends its jurisdiction over the Palestinian territories. Euro-Med Monitor condemned Israel’s targeting of the headquarters of the Al-Aqsa TV channel and a building belonging to the media network in Hayy al-Nasr, west of Gaza City. Although these facilities belong to Hamas and do broadcast propaganda messages supporting the movement, they remain civilian objects that should not be targeted unless they play a direct role in the hostilities. Israel’s targeting of a media facilities indicates its country's fear of possible documentation of its army’s violations, said Euro-Med Monitor, stressing the need for sparing the media and its institutions the impact of military operations as dictated by the rules of international humanitarian law and the duty to protect journalists. The Israeli army’s targeting of civilian establishments in Gaza started on the evening of November 12 by an airstrike at 7:35 pm local time, destroying a residential house north of Rafah City in the southern Gaza Strip. Another airstrike followed destroying a residential building in Bani Suhaila east of Khan Yunis in the southern Gaza Strip at 8:15 pm. A residential building was also targeted at 09:40 pm in the Remal neighborhood, west of Gaza City, leaving the building in ruins. On the morning of November 13, the Israeli airforce targeted another residential house in the Remal neighborhood. Ten minutes later, at 5:28 am, another airstrike hit in the same area, destroying a five-story residential building. The Israeli forces should rather be ashamed of these acts resulting in the destruction of civilian buildings, added Pritchett, calling for holding accountable the perpetrators of these crimes, not threatening of committing them again. Such statements speak of ill-intentions on the part of Israeli officials, and could indeed lead to extensive targeting of civilian installments. Euro-Med’s team will continuously update the information on the situation as developments on the ground continue to unfold and will monitor all violations and publish them in hopes that they help stop the deliberate targeting of civilians and end the attacks on the long-blockaded, impoverished Strip. The Euro-Mediterranean Human Rights Monitor calls on the United Nations and the UN’s commission of inquiry to send a field mission to the Gaza Strip to monitor the incidents and violations closely and to pressure the Israeli authorities to stop their operations against the Gaza Strip and to lift the blockade.